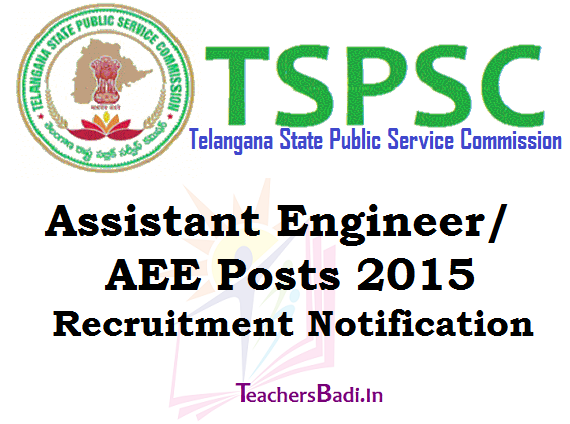 TSPSC Assistant Engineers Recruitment results/Selected Candidates list: Telangana State Public Service Commission (TSPSC) announced that would release the next TSPSC Assistant Engineer/AE Posts 2015 Recruitment Notification for filling up 563 Assistant Engineers (AEs) posts on 29-08-2015. The Commission has stated that the candidates can apply online through TSPSC website www.tspsc.gov.in from August 29 and last date for applying was September 28. The posts were both in civil and mechanical engineering in various departments like Public Health and Municipal Engineering, Rural Water Supply and Sanitation Engineering Department, Roads and Buildings. Before applying for the posts, the candidates should register with through ‘One time Registration’ (OTR) which was available on the TSPSC website. The candidates who had already registered can apply by just logging in to their profile using TSPSC ID and date of birth as provided in the OTR, the release said. The detailed syllabus for civil and mechanical engineering would be made available on the website. The Commission is taking all the necessary steps to publish the final selection of candidates on the website within two weeks from the date of conduct of examination. 3. Hall Tickets: The hall tickets can be downloaded a week prior to the exam. 5. Test center: Recruitment exam would be held only in Hyderabad. 1. It is hereby notified that on the basis of the written examination held on 07/11/2015 an verification of certificates held on Dt:21/01/2016, 22/01/2016, 24/02/2016, 24/03/2016, 26/03/2016, 22/04/2016, 23/04/2016, 25/04/2016 & 26/04/2016 at JNTU & TSPSC Office Hyderabad to the posts of Assistant Engineers in various Engineering subordinate services, Municipal Assistant Engineers & Technical Officers in Public Health and Municipal Engineering subordinate services . The following register numbers have been provisionally selected for appointment to the posts of AE/TO/MAE in various Engineering subordinate services vide Commission’s Notification No.09/2015 subject to the following conditions.